A cliffside sentinel stands its post beside Kendall Katwalk. Pacific Crest Trail, Section J, July 29, 2013. Gauged by its cliff’s-edge finale, this rewarding trail begins rather unassumingly at the southern end of the Pacific Crest Trail’s Section J in pleasant coniferous forest, but climbs to increasingly expansive views as it traverses Kendall Peak’s western flank and, at its dramatic highlight, crosses the narrow ledge hewn into the face of a sheer rock ridge known as Kendall Katwalk. As incredible as the bird’s-eye views are, the trail also offers a wealth of bug’s-eye views as it progresses through habitats ranging from dim, moist forest to rocky barrens that are home to an array of wildflowers, fungi, lichens, and small mountain creatures. The Katwalk is a popular destination for day hikers, although the increasingly sweeping mountain views and swathes of summer wildflowers draw many further to the side-by-side pair of lakes, Gravel Lake and Ridge Lake, approximately 1.25 miles/2.00 km beyond the Katwalk. Although lengthy (one could follow the Pacific Crest Trail northward into Canada or southward all the way to the Mexican border), the gentle grade of this section enables the hiker to attain greater distance and elevation without tiring as quickly as on steeper trails. Dim, moist forest encloses the lower trail. Pacific Crest Trail, Section J, October 22, 2016. Throughout the trail’s woodland sections, streams dash across the trail on their way to Commonwealth Creek below. Varying in size depending on their source and the season, some merely dampen the trail while others require skips across sometimes slick stones. Pacific Crest Trail, Section J, August 05, 2011. Even the damp lowland forest shelters vibrant blooms. In the top left, a queen’s cup (Clintonia uniflora) demurely twinkles on the forest floor. 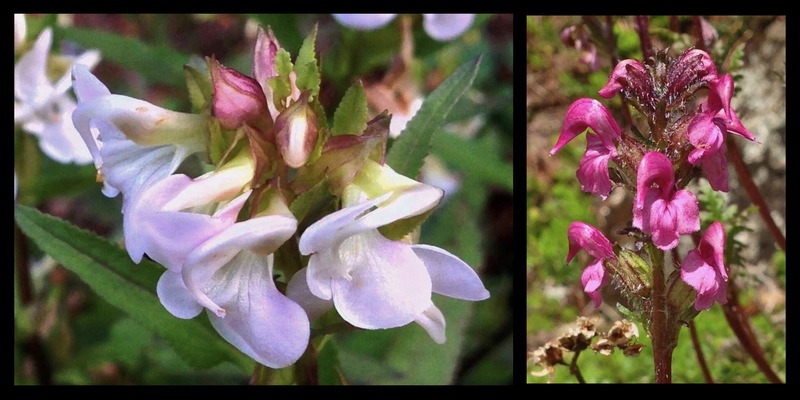 The fuzzy-throated Lewis’s monkeyflower (Erythranthe lewisii) gaping in the lower left photo mimics the closely related domestic monkeyflower (Mimulus sp.). On the right, the blooms of the Columbian monkshood (Aconitum columbianum) darkly portray the greatest cowled figure of all, for it is so toxic that death surely follows ingestion and even its touch may impart illness. Pacific Crest Trail, Section J, July 29, 2013. A variety of fanciful mushrooms abounds along the trail, especially in the moist lower-elevation woodlands. In the top left, yellow-legged bonnets (Mycena epipterygia), appear to totter on spindly stems. In the top right, a dapper Russula species softly glows as if lit from within. In the lower left, shaggy-topped and royally hued violet webcaps (Cortinarius violaceus) add unexpected texture and color to the forest floor. In the lower right, cinnamon fairy stools (Coltricia perennis) form groups of distinctive, ringed disks along the upland trailside. Pacific Crest Trail, Section J, July 28, 2014, October 19, 2014, and October 22, 2016. Other curiously formed fungi are also plentiful throughout the lowland wayside. In the top left, what is likely a coral tooth fungus (Hericium coralloides), emerges from a buried log. In the top right, tiny, gem-like eyelash cups (Scutellinia scutellata), named for their strangely fringed edges and also imaginatively known as scarlet pixie caps, nestle in a setting of moss and wood. In the lower left, luminous arms of one of many species of coral fungi reach into the daylight. In the lower center, chicken-of-the-woods (Laetiporus sp.) ruffles the base of a trailside snag. In the lower right, wood conks (likely artist’s conks, Ganoderma applanatum) line a tree stump like a tower of gnomes’ homes. Pacific Crest Trail, Section J, July 29, 2013, August 24, 2013, and October 19, 2014. Approximately two miles/3.20 km from the trailhead, the landscape suddenly changes as the trail traverses a lengthy field of haphazardly tossed boulders, some approaching room size. Where woodland gives way to talus, forest colonnades rise sharply from their stony foundation. In summer, red elderberries (Sambucus racemosa) drape the stony wayside. Look, but do not yield – all parts of the red elderberry are considered poisonous and even birds leave the plentiful, luscious-looking berries untouched. Pacific Crest Trail, Section J, August 2011 and 2014, October 2015. Guye Peak’s unique spire dominates the view from the boulderfield. Pacific Crest Trail, Section J, October 19, 2014. Red Mountain anchors the northern view from the mid-section of the trail. Commonwealth Basin forms a hollow below, leading to Red Pass, the junction between Red Mountain and Lundin Peak to its left. The Pacific Crest Trail skirts Kendall Peak to the right and reaches Kendall Katwalk just beyond the far horizon. At approximately 2.50 miles/4.00 km from the trailhead, another trail branches to the left and descends into Commonwealth Basin and up to Red Pass and Lundin Peak. Pacific Crest Trail, Section J, October 14, 2018. At approximately 3.50 miles/5.60 kilometers from the trailhead, the trail enters a sudden gash in the forest, marked by tossed and broken trees amid mounds of finer debris. This is Kendall Peak’s avalanche chute, which is safe to traverse in summer months when no snow is present. Fireweed (Chamerion angustifolium), quick to reclaim disturbed woodland as its name implies, swathes the damage in vibrant color. Pacific Crest Trail, Section J, August 31, 2012. Upward from the trail, Kendall Peak’s avalanche chute zigzags toward its source beneath the summit’s eaves. In little more than a mile/1.60 km from the avalanche chute, the trail traverses the vast alpine meadow visible above, where panoramic views begin. Pacific Crest Trail, Section J, September 09, 2018. Sun-loving wildflowers and the creatures that frequent their blooms line the forest edges and stony meadows. In the top left, one of many species of Apollo butterfly (likely a female clodius parnassian, Parnassius clodius) feeds on an orange hawkweed (Hieracium aurantiacum). Bent at its labor in the top right, a bumblebee (Bombus sp.) forages on a western pearly everlasting (Anaphalis margaritacea). In the lower left, the ready-made bouquet of a Sitka valerian (Valeriana sitchensis) extends a fringe of pistils to potential pollinators. In the lower center, a western, or, Sitka columbine (Aquilegia formosa) lofts its lantern-like bloom. In the lower right, banks of plumed Solomon’s seals (Maianthemum racemosum) scent the trailside with a citric fragrance. Pacific Crest Trail, Section J, August 05, 2011, July 29, 2013, and August 23, 2014. Beyond the avalanche chute, the trail reenters forest and climbs to Kendall Ridge, which, because of the trail’s welcome level grade, is also known as Kendall Flats. Pacific Crest Trail, Section J, September 09, 2018. Beyond Kendall Flats, the trail breaks out of forest and crosses the open, talus slope that stretches from Kendall Peak’s cliff-topped summit to its avalanche chute below, affording a sweeping western view. Pacific Crest Trail, Section J, September 09, 2018. Nourishing a host of summer wildflowers, Kendall Peak’s sunny upper reaches are known as Kendall Gardens. Here, fireweed (Chamerion angustifolium) fringes the western view. Far below, Interstate 90 snakes through the mountain folds. Pacific Crest Trail, Section J, August 23, 2014. Kendall Gardens and the meadowlands beyond host a variety of summer wildflowers. In the top left, a delicately hued variation of the scarlet paintbrush (Castilleja miniata) nods into the alpine sunlight. In the top right, a gaggle of woodland penstemon, or, woodland beardtongues (Nothochelone nemorosa) gawks at passersby. In the lower left, a rosy spirea (Spiraea splendens) wafts a clove-like scent from its powder-puff bloom. In the lower right, wiry-stemmed harebells (Campanula rotundifolia) toss laughingly in the slightest breeze. Pacific Crest Trail, Section J, August 07, 2011, July 29, 2013, and August 23, 2014. As the trail rounds Kendall Peak, it offers views of Red Mountain’s distinctively hued stone, thought to obtain its contrasting color from the presence of iron oxide. Pacific Crest Trail, Section J, August 23, 2014. At last, Kendall Katwalk. During construction of the Pacific Crest Trail, the Katwalk was blasted from the side of the razor-edge granite saddle that connects Kendall Peak to its neighboring peaks. The narrowest and highest portion of Kendall Katwalk extends approximately 450 feet/137 meters. The natural rock wall along its western side may provide some comfort to the more acrophobic hiker. Pacific Crest Trail, Section J, August 23, 2014. Over Kendall Katwalk’s brink, the nearly vertical view plunges headlong, dwarfing the forest far below. Exercise great caution while crossing, as falls will be lethal. Pacific Crest Trail, Section J, September 09, 2018. Kendall Katwalk’s breathtaking eastward prospect soars down Silver Creek Valley, across Gold Creek Valley, and on to Alta Mountain and beyond. The craggy peaks to the right form Kendall Peak’s northeastern spine. Pacific Crest Trail, Section J, July 29, 2013. 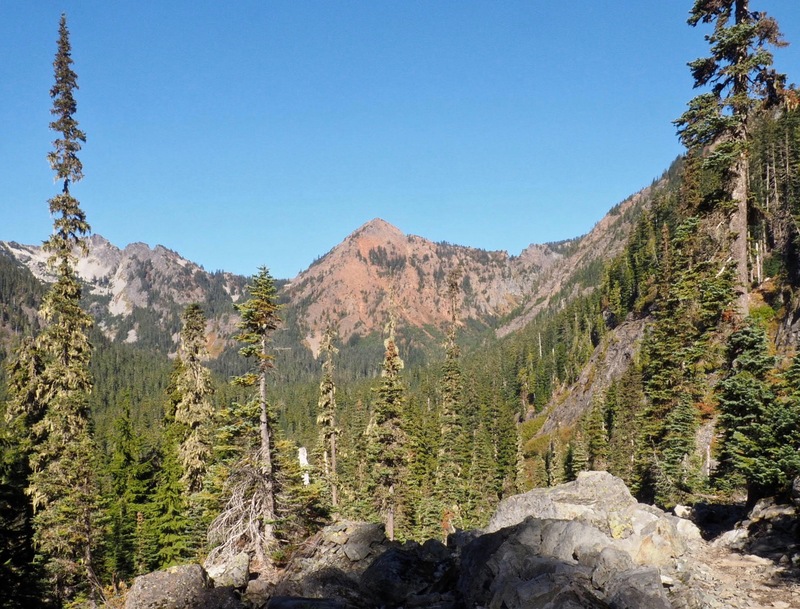 Although Kendall Katwalk is a perfect day hike destination, the increasingly expansive mountain views and masses of wildflowers just beyond lure many hikers farther, particularly given the trail’s relative lack of incline for some distance thereafter. Pacific Crest Trail, Section J, August 23, 2014. Beyond Kendall Katwalk, Kendall Peak’s crinkled eastern spine becomes visible. Pacific Crest Trail, Section J, August 23, 2014. Just beyond Kendall Katwalk, tumbling drifts of wildflowers, especially lupine (Lupinus sp. ), border the trail. Pacific Crest Trail, Section J, July 29, 2013. Louseworts, unfortunately named for the contradicting and equally false beliefs that they both attract and repel lice, are some of the many alpine wildflowers found along the stony trailside around Kendall Katwalk. As if frozen in motion, delicately whorled blossoms of the sickletop lousewort (Pedicularis racemosa) (left) resemble a whirling ensemble of silk-draped dancers. Another distinctively formed lousewort, the bird’s beak lousewort (P. ornithorhyncha) (right), rears spikes of blooms adorned with flamingo-like topknots. Pacific Crest Trail, Section J, August 23, 2014. As the trail turns westward, the tri-cornered Mount Thompson appears. Gravel Lake and Ridge Lake soon appear in hollows along its broad, southern flank. Pacific Crest Trail, Section J, August 23, 2014. Around a corner in the trail, Ridge and Gravel lakes suddenly appear. Ridge Lake is to the right, ringed by trees and vegetation. Pacific Crest Trail, Section J, September 09, 2018. The aptly named Gravel Lake lies to the left, its clear waters revealing its almost entirely rocky bottom. Gravel Lake also has no above-ground outlet, but seeps through the stones at its far end and forms a small stream farther down Mount Thompson’s western flank. Pacific Crest Trail, Section J, August 23, 2014. At Gravel Lake, the trail has reached the opposite side of Red Mountain and Lundin Peak from where it began, with a view up the far side of Red Pass. Pacific Crest Trail, Section J, August 31, 2014. To continue the alpine views, follow the trail a mere 700 feet/213 meters around Ridge Lake for a bird’s-eye view of Alaska Lake and Alta Mountain (right), with Three Sisters (left) and Hibox Mountain (center) peering over the horizon. Pacific Crest Trail, Section J, September 09, 2018.